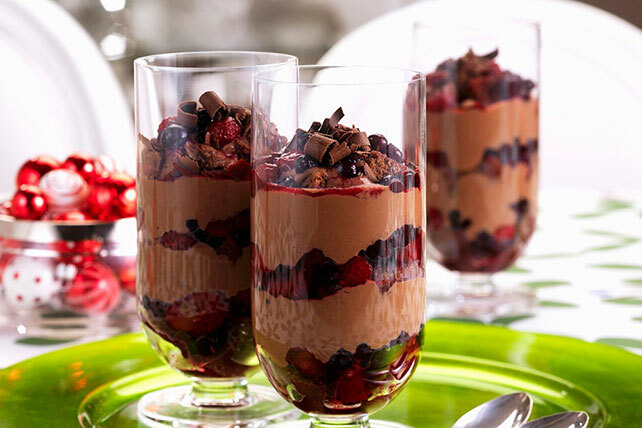 Berries are a dream team paired with rich chocolate pudding - layering them in clear parfait glasses gives your guests a sneak peak of what’s to come. Chocolate curls make for an elegant presentation in this no-bake dessert. Combine berries, sugar and lemon juice in medium bowl. Refrigerate 30 min. Meanwhile, whisk chocolate pudding mix and milk until thickened. Stir in Cool Whip. Layer berries and pudding mixture in 4 parfait glasses. Shave chocolate into curls to garnish. Warm chocolate by microwaving it on HIGH for a few seconds or just until you can smudge the chocolate with your thumb. Hold the chocolate piece steadily; draw a vegetable peeler slowly over the chocolate to form curls.